I greatly value my fishing pictures as reminders of great times spent on the water with good friends. At the end of the day all we bass fishermen derive pleasure from sharing with our fishing buddies the stories about the bass we caught, or missed, that day. Where we were when we caught this or that bass. Whether we were fishing a bluff, weed bed, flat or point. Were they deep or shallow. What lure we caught a bass on and the technique we were using. Our stories are usually a combination of truth and exaggeration. It's the nature of the bass fisherman beast you know. However, when photos are taken there can be no argument as to size. Plus, we are often educated by the stories surrounding other bass angler fish pictures. We sometimes learn of a lure or technique of which we were unaware or perhaps had just never tried. 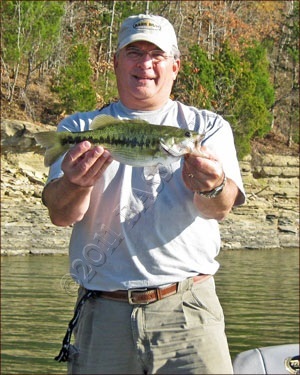 Also, we often educate others by sharing the details of our successful bass fishing trips. IMPORTANT: When you submit your photograph(s) complete as much of the following form as possible. We've made it easy to do so by providing "radio buttons", comment boxes and Don't worry about spelling, punctuation, etc. etc. I'll edit it if needed. To add your picture or pictures, just click the browse button and find pictures on your computer. Select the first one you want then just click on it to upload it here. Repeat for additional pictures. All items with a star must be completed! 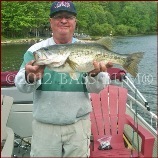 Two good examples of expanded submissions that provide descriptive information are those from Georgia Pond Bass and My Personal Best Largemouth Bass - 7.75lb. See some of your fellow angler Bass Bums and their bass. How do you compare? Send us a photo or two we can post. 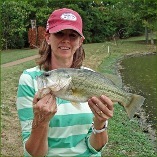 Return to Bass Fishing and Catching Home Page from My Fishing Pictures. Each photo has a story behind it. Chances are each story is one that speaks of the joy of bass fishing. Just look at the faces. That would be the angler's faces of course, not those of the bass. 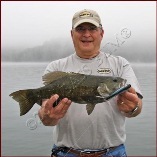 Smallmouth Bass caught topwater on a Gunfish. The Pond Princess lands another pond largemouth. 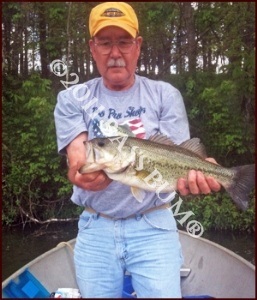 A 7.5lb largemouth "hawg" caught next to a stump in three feet of water on a Pop R.
Katy is an old hand at catching bass. This fella is 90 years young and still catching them.